Ocean Resort offers a unique approach to getting away—and finding yourself. My heart pounding, I crouch anxiously behind the bunker—the only thing protecting me from a sure barrage of enemy fire. A bead of sweat trickles down the bridge of my nose. The cold steel of my automatic weapon, which I’ve just used to dispatch two enemy fighters, feels reassuring in my clenched hands. Only now I don’t know which way to point it. Somewhere out there in this barren field, hiding behind a bunker just as I am, is one last enemy. Cautiously, I poke my helmeted head around the bunker and scan the battlefield. I feel exposed. Vulnerable. The dusty monochrome field, littered with tires, plywood bunkers and no shortage of hiding spots, blends seamlessly with the grey sky above. He could be anywhere. Suddenly, I see movement. He’s behind a bunker about 50 metres ahead. I’ve got him. I rise to my feet, fix my sight on the bunker and slowly advance. My finger flexes against the trigger. Adrenaline courses through my veins. A helmeted head pokes above the bunker. I pull the trigger. “Aaaggghh…!” The metallic, computerized death scream that emanates from the enemy’s weapon tells me that he’s dead. I’ve won. Sure, if this were a real battle I would have been dead myself a few times over, as the display on the back of my weapon tells me that I was hit seven times over the course of the frenzied 10-minute firefight. But this isn’t a real battle. It’s North Island Battlefield. It’s laser tag, and it’s awesome! Forget everything you think you know about laser tag. 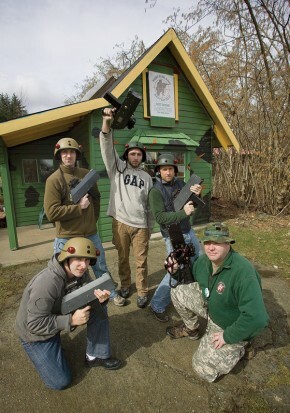 As Vancouver Island’s only outdoor laser tag operation, North Island Battlefield isn’t about the flashing lights, smoke machines and other faux-futuristic kitsch that I’d experienced with indoor laser tag as a teenager. It’s about realistic missions and combat scenarios that offer all the excitement of real battle without any of the nastiness that accompanies actually being shot. Above all else, however, it’s about good, clean fun. During the spring and summer, North Island Battlefield is open daily for public games, with each game accommodating up to 40 players. Groups of 10 or more can also book private sessions whenever they want, day or night and year-round, either at Cowan’s four-acre battlefield near Black Creek or at any location that the group has permission to use. Although hugely popular in Australia and gaining momentum in the US, laser tag remains relatively obscure in British Columbia. In fact, North Island Battlefield is one of only a small handful of outdoor laser tag facilities in the entire province. Nonetheless, Cowan feels that the tide is slowly turning as people begin to realize that laser tag can deliver all the excitement of other combat simulations, like paintball, without any of the pain. “With paintball, a lot of people say they’ve done it once,” says Cowan. “They do it once and they don’t like the bruises and welts that they get. Laser tag, a gimmicky name that belies the game’s intensity (and the fact that most laser tag weapons are more similar to your TV’s remote control than to an actual laser) was born back in 1979 with the release of Star Trek’s original Electronic Phaser toy. Since then, it has evolved into a massive industry, with both indoor and outdoor venues offering leagues, tournaments and public games. Despite its relative obscurity in British Columbia, national laser tag championships are held annually in both the United States and Australia, and every July players from around the world compete for international supremacy in a four-day tournament known as Armageddon. A simple game at North Island Battlefield plays out as follows: Cowan divides the group into two teams and kits each player out with a “Scorpion” sub-machine gun and a helmet rigged with three sensors. After explaining the rules and loading each soldier with a pre-determined number of “lives,” he blows a whistle and the players disperse on the battlefield. A second whistle signals that the battle has begun. The first team to “kill” all of the opposing players wins. Sound simple? It doesn’t have to be. Possible scenarios include “capture the flag” games and missions to a particular bunker by a certain time limit. When I was invited out for a game with a small group of mercenary friends, Cowan led us through another popular scenario. Donning the role of enemy sniper, Cowan hid amongst the trees at the far end of the battlefield and began picking us off as we scrambled from cover to cover trying to locate him and take him out. It was absolutely nerve-racking. The short dashes between bunkers seemed like marathons. Occasionally our guns would issue a surprised “Ow!” indicating that we’d been hit. We didn’t know where the sniper was and we didn’t know where it was safe to take cover. While I’d never want to be put in that situation for real, on the North Island Battlefield, it was a tremendous rush. “You don’t realize how hard it is for real,” says Cowan after we’d finally tracked him down and dispatched him. “If you’re running around with 50 pounds of kit and body armour and a proper Kevlar helmet, not a plastic one, it’s hard work.” I assumed he was talking from speculation rather than from any personal experience. I was wrong.